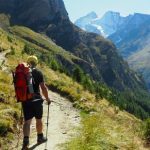 If you are heading off to the Alps next summer season, consider enhancing your enjoyment, efficiency and summit chances on that trip with some UK based mountaineering and fitness training before you go. 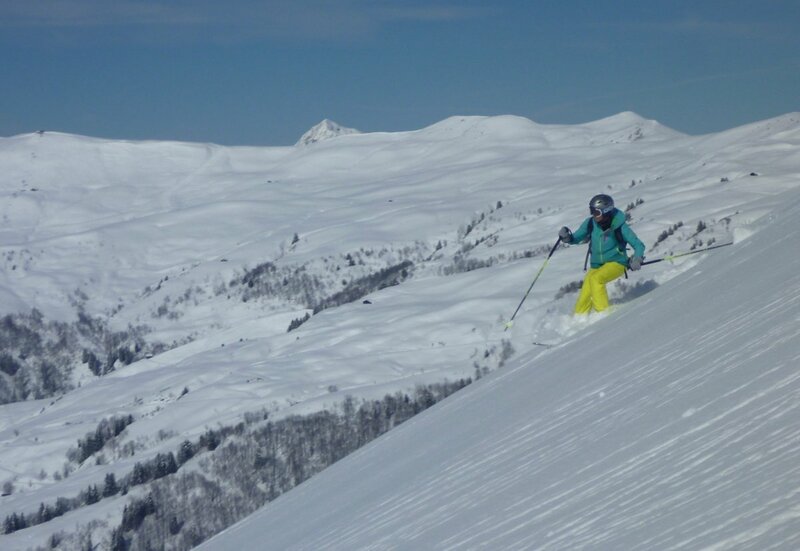 Our team alpine training courses offer quality relevant technical & physical training as well as a sociable opportunity to meet like minded others heading off on similar trips during the alpine season. Dariusz enjoying the super scrambling and views from high on Crib Goch, Snowdon Horseshoe as part of our Mont Blanc Training weekend in Snowdonia. Photo Andy Teasdale. 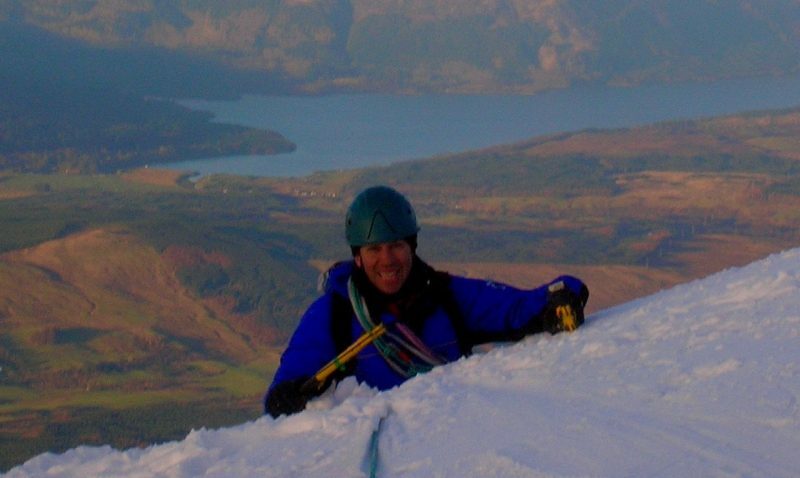 As well as being a great place to go climbing the UK mountain scene is an excellent training ground for developing the mountaineering skills of ice-axe and crampon use; climbing ropework and the all important mountain movement skills be they for scrambling, rock climbing or winter mountaineering. 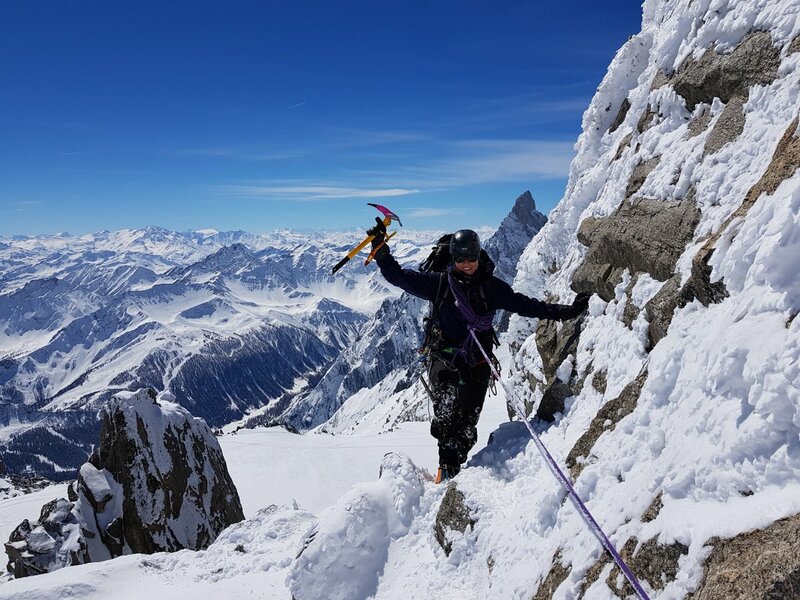 So whether you are off to climb Mont Blanc, the The Matterhorn, Eiger or discover our classic Becoming an Alpinist courses or training for a mountaineering expedition, the confidence and experience gained from this extra preparation can go along way to help getting you there. 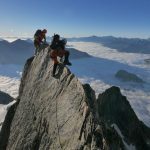 Whilst the challenges on Mont Blanc are mainly physical (you will not be hanging off your finger nails!) 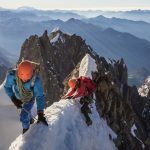 you also need to prepare technically for the mixed / rocky scrambling between the Tête Rousse and Gouter Huts on the classic northern ascent route from the French side of the mountain. Many aspiring climbers have been shocked at how steep this appears on the approach trek. As this photo of the approach to the Gouter Hut shows, those expecting a ‘non-technical’ trek, might be rather alarmed! 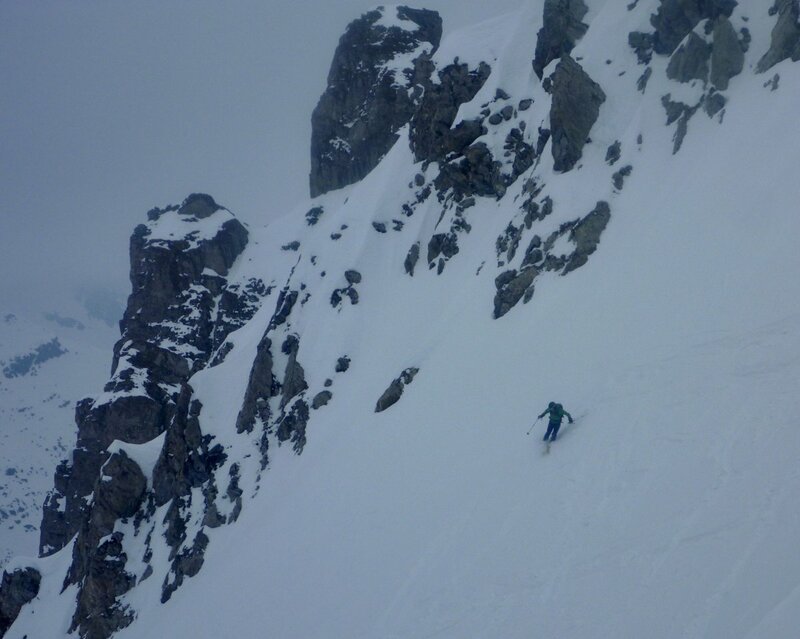 This section is just below the old Gouter Hut with the Tete Rousse Hut 700m below on the other (right) side of the Grand Couloir. Matt engrossed in the sustained scrambling on the Gouter Ridge, Mont Blanc. Well worth training for! 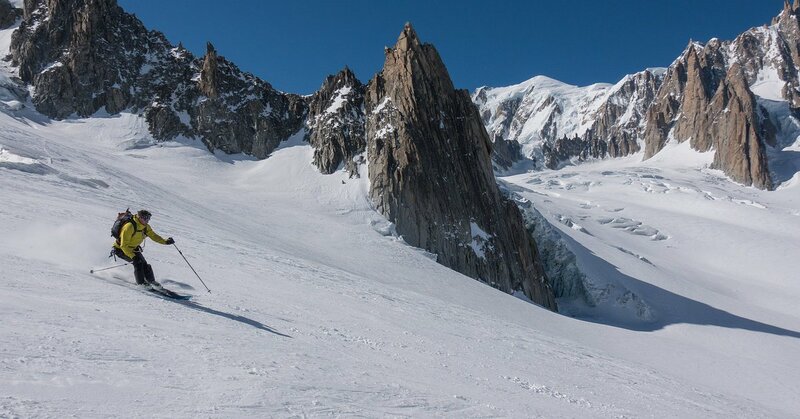 Mont Blanc is the highest mountain in the Alps and to enjoy a safe and stylish ascent you will need to focus on your own personal fitness and body weight management programme as well as doing some more specific training in the mountains. This specific mountain preparation will not only help to prepare physically but, with greater competence and confidence moving over the more technical terrain, you will also be more efficient and save energy for the really demanding final high altitude section of the summit climb. 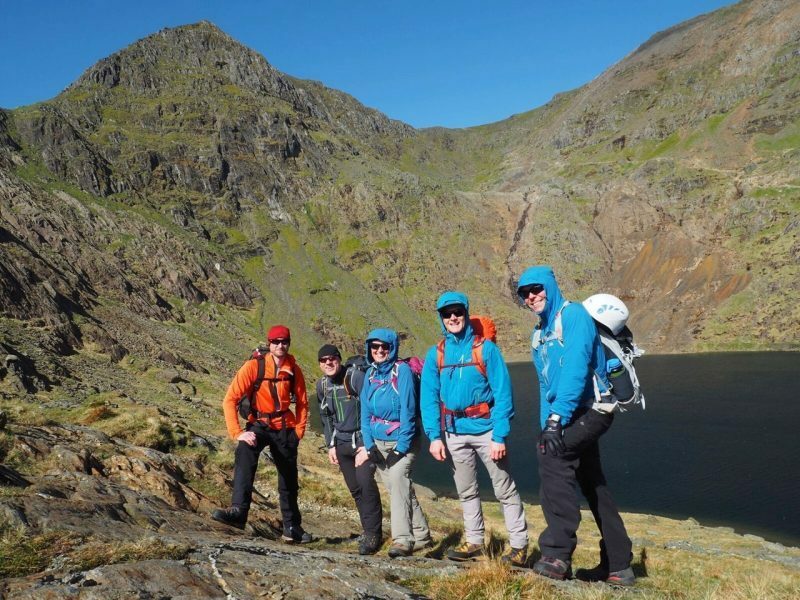 Our Snowdonia based Mont Blanc Training weekend addresses these related and enjoyable elements in helping you to prepare for this big challenge. 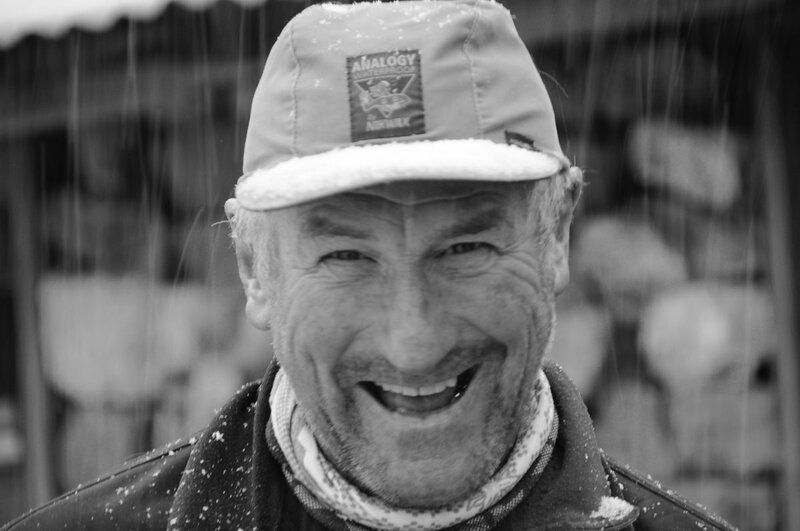 It should also provide a great opportunity to meet some other llike minded Mont Blanc climbers for a sociable weekend in the mountains. From 0800 in Pete’s Eats in Llanberis for an 0830 Welcome to the course, introductions, weather forecast and planned programme. Equipment checks. Mountain day of c.6-8 hours starting with an approach walk to a steady scramble perhaps including the magnificent traverse of Tryfan and Glyder Fach – The Bochlwyd Horseshoe – whilst discussing movement skills; being efficient for general mountain travel and using your mountain boots accurately & securely. 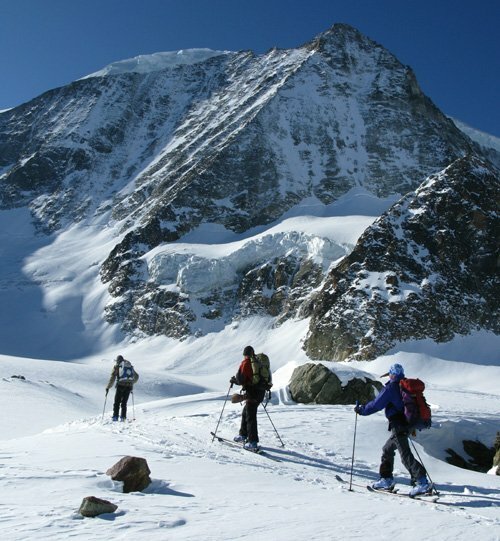 Use of technical mountaineering gear including harness, helmet and roping up for moving together in ‘alpine style’. 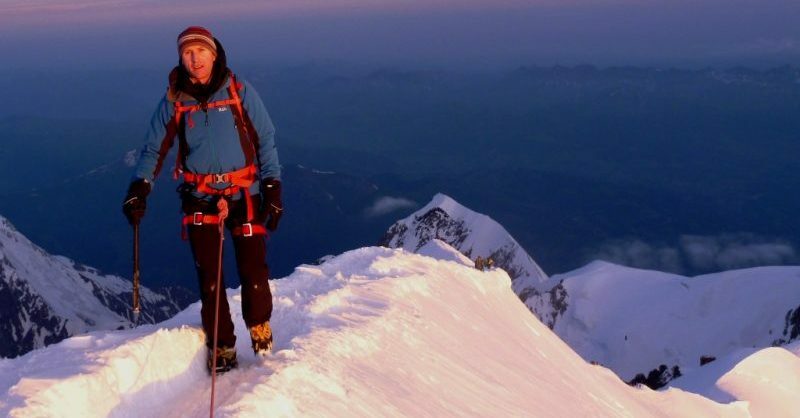 Early evening informal talk, 6.30-7.30 PM at Pete’s Eats, describing the ascent of Mont Blanc, what is involved, fitness levels, equipment requirements and a chance to ask any questions about any aspect of the ascent and preparation. Possible route choice could be scambling on and around the Snowdon Horseshoe, Cneifion Arete above the Ogwen Valley, with descents of other routes to practise scrambling in descent facing in, out, and across! 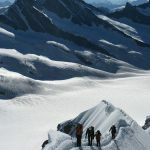 There are lots of other good options which present the combination of sustained scrambling passages with easier walking sections, just like on the climb to the Gouter Hut on Mont Blanc. 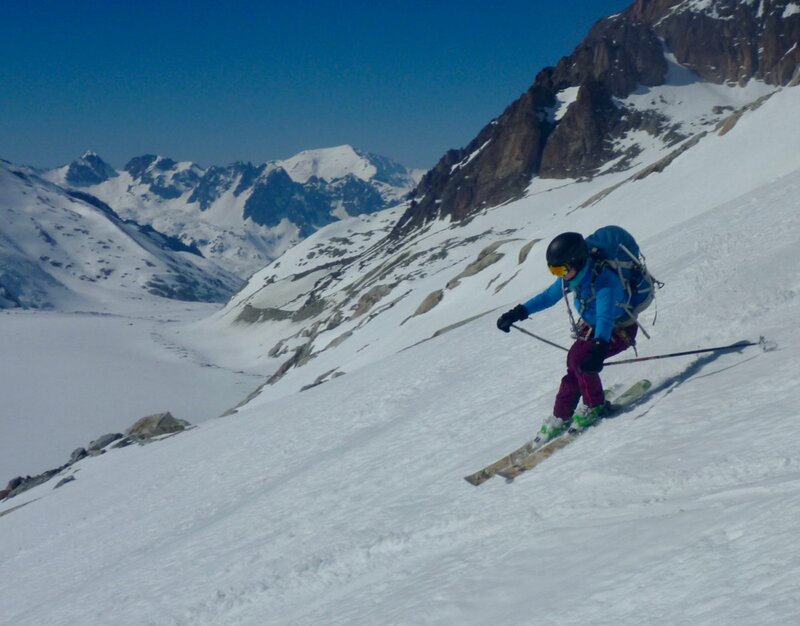 This final day will also give a good opportunity to put some mountain miles in the legs, add to your general endurance training and give you the chance to get some expert feedback on how your fitness is shaping up with regard to a future Mt Blanc ascent. The vertical height interval from the Tête Rousse hut to summit of Mont Blanc is around 1700m, at high altitude, so you can compare the ascent done today and reflect on your fitness & movement skills levels accordingly and plan further training as necessary. Thoroughly enjoyed this weekend – first class coaching, great climbing companions, challenging routes and outstanding weather conditions! Kevin. Llanberis is a great base camp for our Mont Blanc & Matterhorn training weekends. 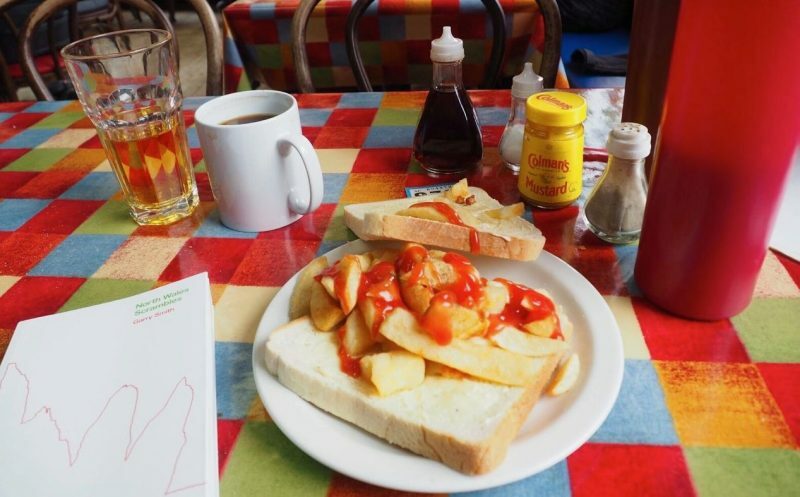 The famous Pete’s Eats cafe forms a great meeting point & celebrated British climbers café! 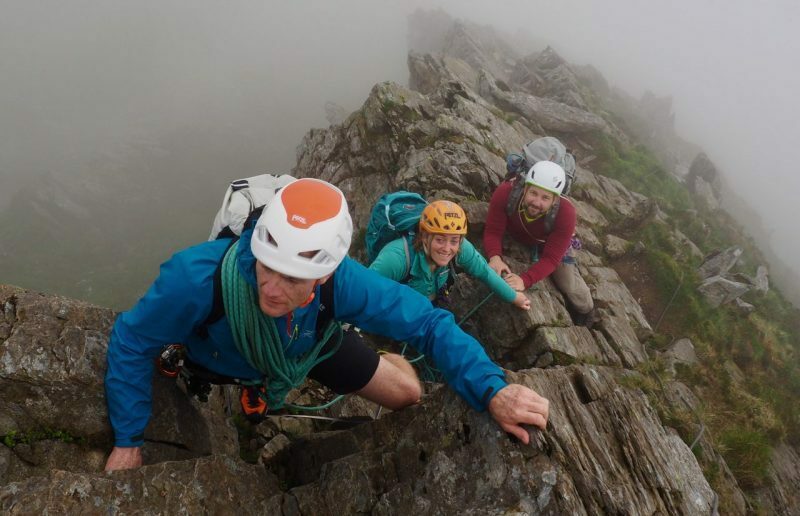 This late spring course in the Scottish Highlands makes an inspiring complement and progression from our Snowdonia Mont Blanc training weekend. The high mountains of Lochaber provide a superb arena for alpine mountaineering in the spring, often a magical time to be in the far north! At this time of year they often provide a brilliant combination of stiff re-frozen snow, snowy gullies, mixed and rocky scrambling and lots of day light hours to enjoy it! 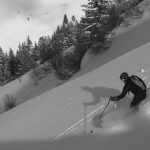 This then creates an inspiring mixture of terrain for quality alpine training and enjoying some long routes and physical journeys in the highest mountains in the UK. 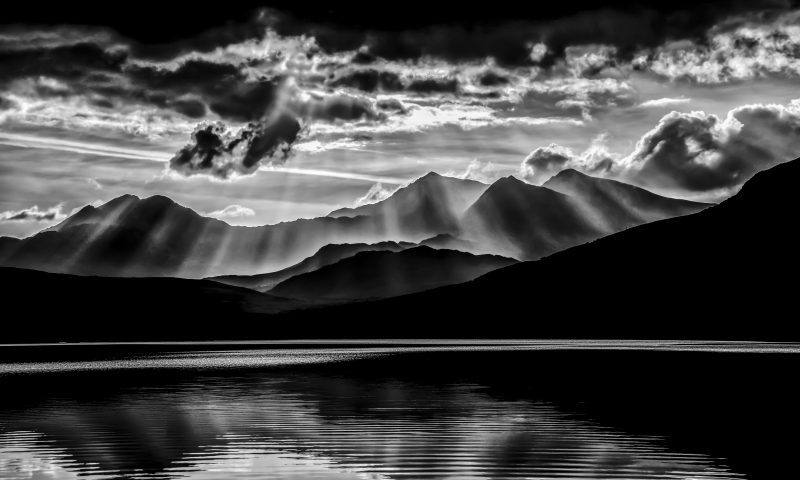 The Western Highlands provide an ideal location for a physical challenge par excellence with sea level or low altitude starts to climb the higest and most celebrated mountains of the UK, like the North Face of Ben Nevis and Glencoe. 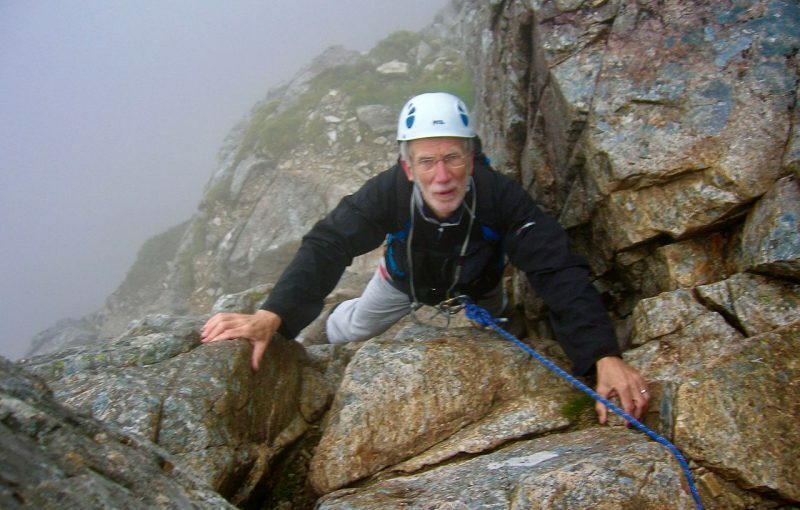 This spring course would work very well for anyone preparing for the ascent of Mont Blanc in the summer or any other strong hill walkers / scramblers keen to develop their alpine movement skills and enjoy a cracking couple of days mountaineering in the Scottish Highlands, whilst meeting some other like minded folk. Brilliant scrambling on Curved Ridge in Glencoe. A great run and fine training for the Gouter Ridge on Mont Blanc! 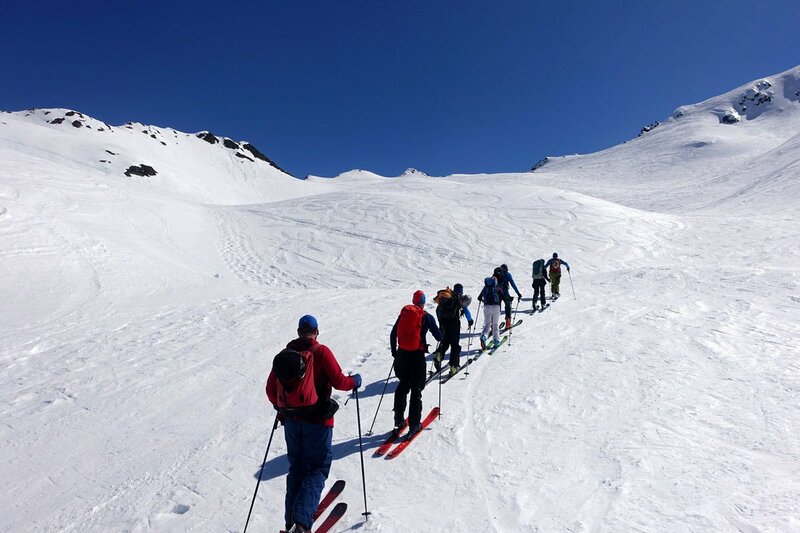 The first day includes a welcome to the course and intro to other guests and the guides with a brief for the plan for the day and final equipment check. The aim is to then make the long climb up one of the high valleys in Lochaber, eg on to the north side of Ben Nevis to find some of the stiff snow patches that are normally still extensive at this time of year. 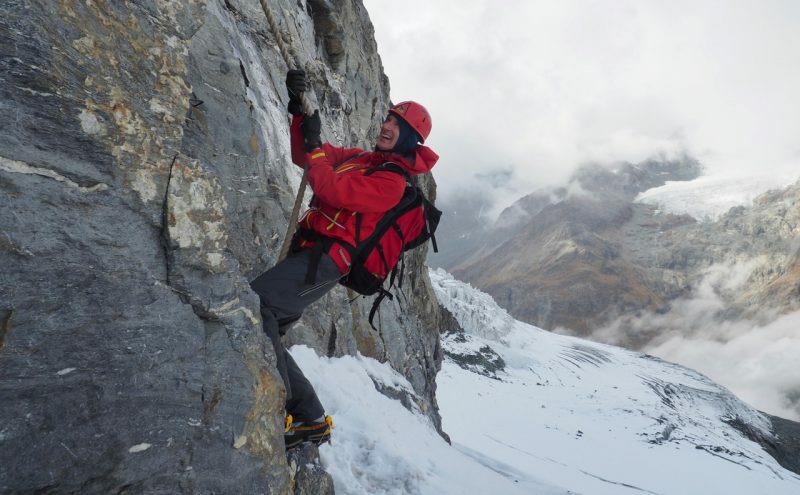 These provide a great training venue for instruction in the use of stiff boot soles, crampons and ice axes in moving securely and efficiently over snow. A key ingredient for a safe and enjoyable ascent of Mont Blanc! 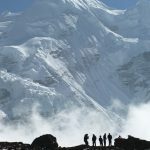 Another key ingredient, mountain endurance, is then worked on with a continuing journey on to the tops to climb one of the big summits of this inspiring area. This day has a maximum guide to guest ratio of 1:4. 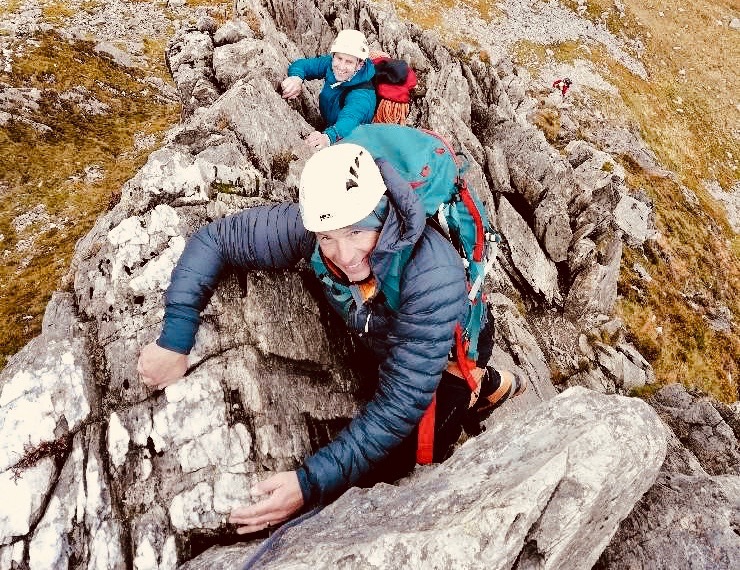 The second day start with an extra guide to allow some more technical scrambling to be done whilst completing a classic Highlands scramble like Curved Ridge or Ledge Route on Ben Nevis. 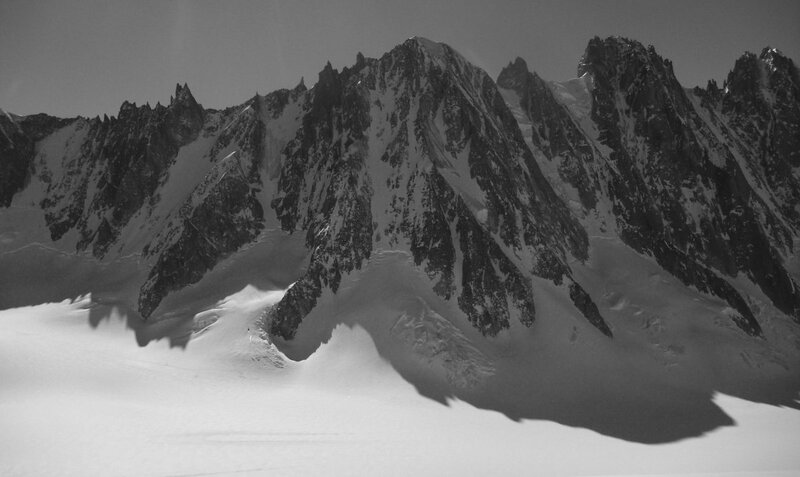 Ideally this will have an approach on stiff snow to allow crampons and axes to be used again and thus create terrain similar to the most technical sections on Mont Blanc. 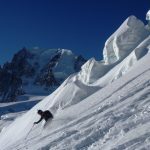 Again we aim to complete a classic route / summit, ideally with some down climbing to replicate the descent of the Gouter Ridge on the north side of Mont Blanc. After a course de-brief over tea and cakes the course usually finishes around 1630 on the 2nd day and you can either stay in Fort William another night or return home later that day. 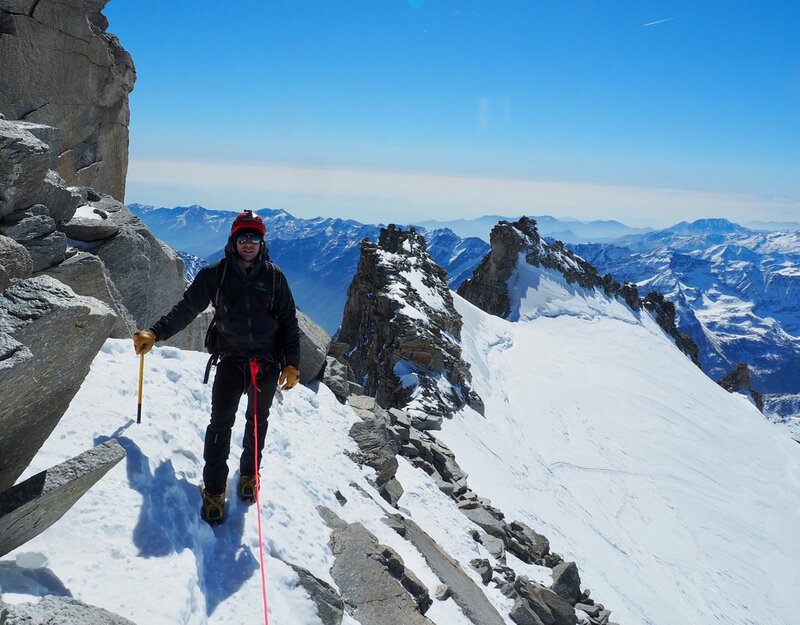 We can also arrange private guiding after the course if you would like to do some 1:1 climbing for example and do some further climbing and Matterhorn preparation whilst you are about it! This day has a maximum guide to guest ratio of 1:2. The 2 physical and technical days should really compliment the fitness and endurance training you are able to do on a regular basis from home. We call this ‘Bulls eye training” and we hope you can join us for a memorable weekend in the mountains of the West Highlands in April 2019. 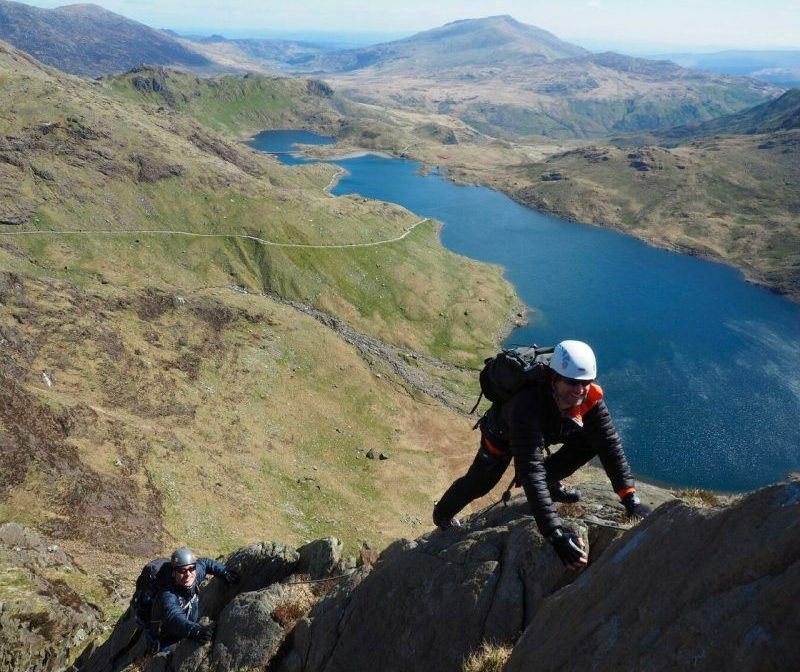 No previous scrambling or rock climbing experience is required but you should however be keen to embrace this enjoyable element of mountaineering; be ready for some exposed scrambling in the mountains and have a reasonalbe ‘head for heights’. This is a guiding / training fee only and does not includes any other expenses like travel, accommodation, insurance or equipment hire. Course Guiding Ratio is 1:4 for the Saturday and 1:2 for the Sunday. 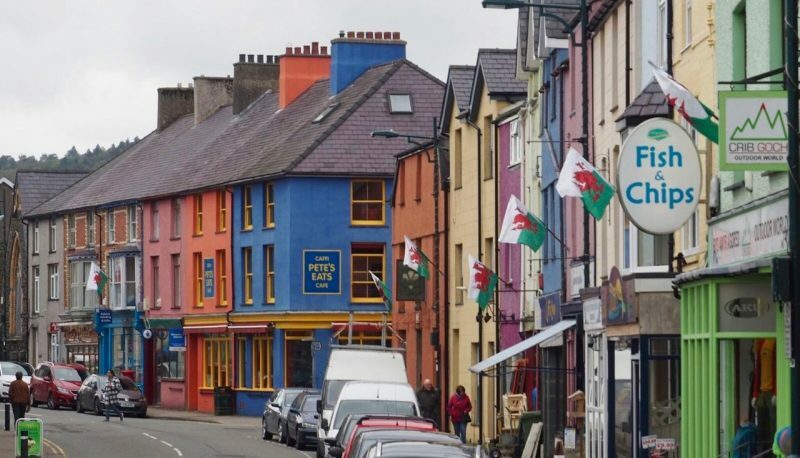 Course Base Camp – Llanberis, Snowdonia: Dol Peris guesthouse (C. £30 self catering) or Plas Coch (C. £60 B & B) in Llanberis or other accomodation in Llanberis, or nearby, of your choice. Course Base Camp – Fort William, West Highlands: Calluna guesthouse (from £20 pppn self catering) or The Lime Tree Hotel (starting from £80 to £130 B & B depending on dates) or other accommodation in Fort William, or nearby, of your choice. We take nutrition seriously on this training weekend…plenty of good cafe action! 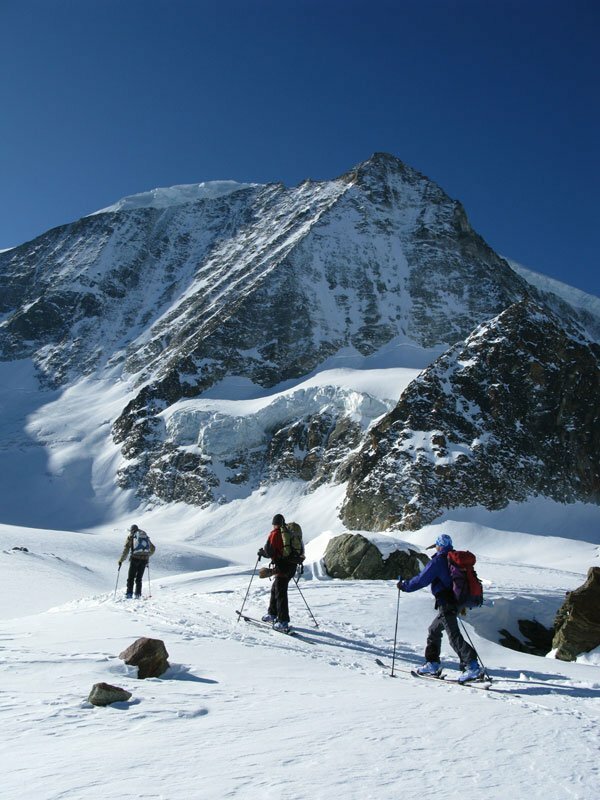 Many climbers, alpinists, ambitious mountain walkers and even arm chair mountaineers dream of climbing the Matterhorn. Well, why not, it’s one of the world’s great iconic mountains. There is a true gasp factor added to almost any view of it, but especially the view from the high street in Zermatt and especially when viewed by somone who has come to climb it! It’s an intimidating route up an intimidating yet truly inspiring mountain. Common sense tells you that the ascent will not be easy and, as is often the case in the mountains, common sense is right. The ascent is long, with very sustained moderate scrambling and some short steep & tricky sections. The trick is to arrive in the Alps well prepared for this demading ascent and this is where our training courses will make a big difference. 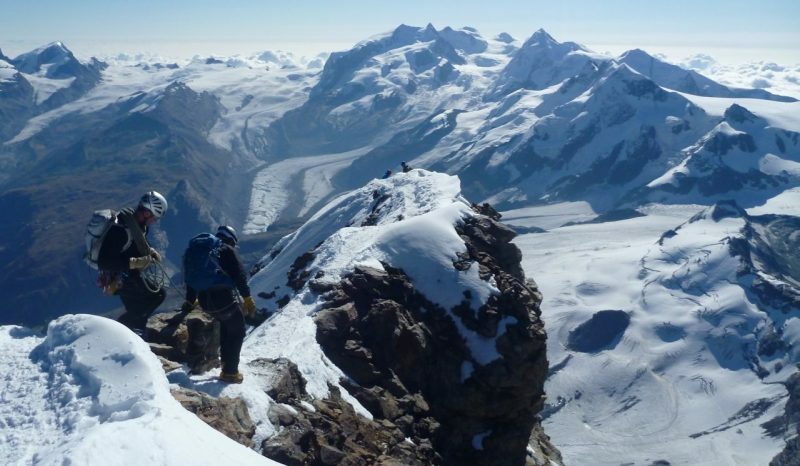 Unlike on some easier alpine peaks where just good fitness is required and we can do the relevant technical training during the course, preparation for the Matterhorn ascent requires a conscientious and determined approach. You will need to arrive for the climb not only fighting fit and raring to go but scrambling fluently in ascent and descent and happy to tackle short, steep & physical sections of rock climbing & climbing fixed ropes. You will also need to be mentally prepared for sustained exposure, following instructions for the route finding in descent and looking after yourself during the demanding mountain marathon of a 7 – 11 hour day. 0830 Welcome to the course & intro chat about the weekend. Final equipment check – but please ensure everything is ready to go for the day. 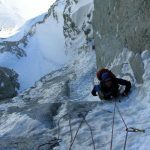 There will also be the opportunity to tackle some steeper rock pitches similar to those encountered for example on the Matterhorn’s Hornli Ridge at about V. Diff in standard. 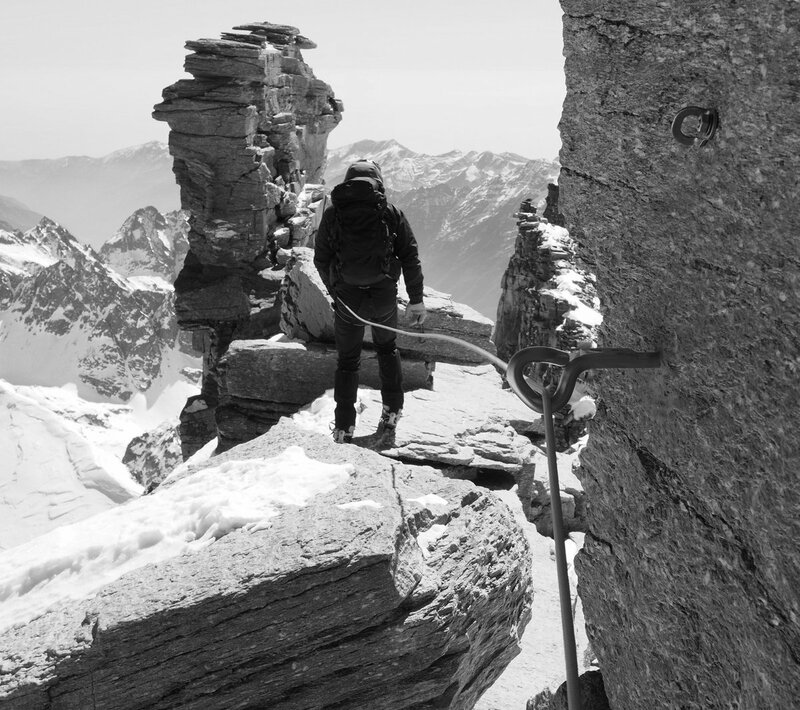 Other important features of the ascent of the Matterhorn are ascending strenuous sections of fixed rope and being lowered confidently down steep walls. Both of these will also be addressed although some improvistation is required for the fixed ropes as these are not a feature of the mountains in Snowdonia! The skills covered can be summarised in the café on the way back with a discussion regarding the progress made during the day and plans for putting it all into practice, higher in the mountains, and with a greater volume of scrambling, the following day. 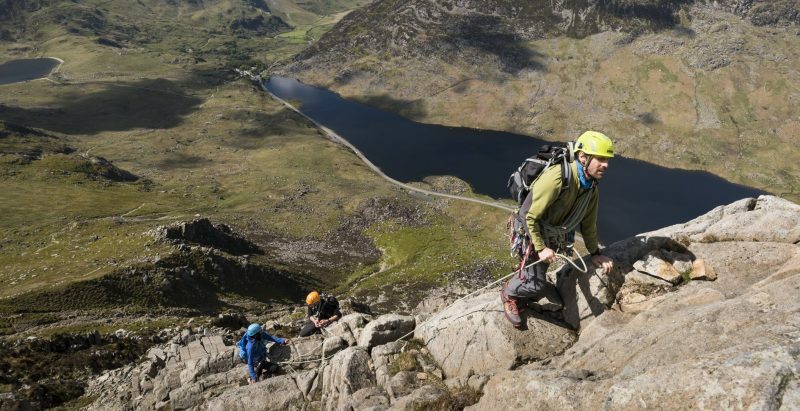 Scrambling on Tryfan – Great Matterhorn Training, high above the Ogwen Valley. Photo: Andy Teasdale. An earlier, 0800 start for an alpine style approach to the high mountains of Snowdonia concentrating on lots of quality scrambling mileage and descent facing in, out, and across!. Possible route choice / areas include Clogwyn y Person Arete, Parsons Nose (Diff) start to Crib y Ddysgl, Idwal Slabs, Cneifion Arete, NW Face Glyder Fach & E Face of Tryfan. 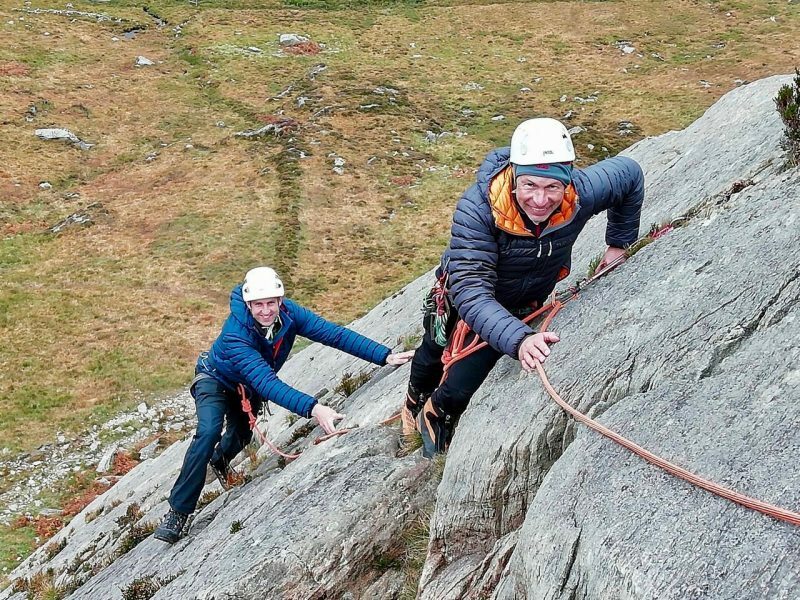 Kev & team high on the brilliant Cneifion Arete in Cwm Idwal as part of a great ‘enchainement’ of scrambles and big boot rock climbing. Matterhorn training par excellence! This is a guiding / training fee only and does not includes any other expenses like travel, accomodation, insurance or equipment hire. 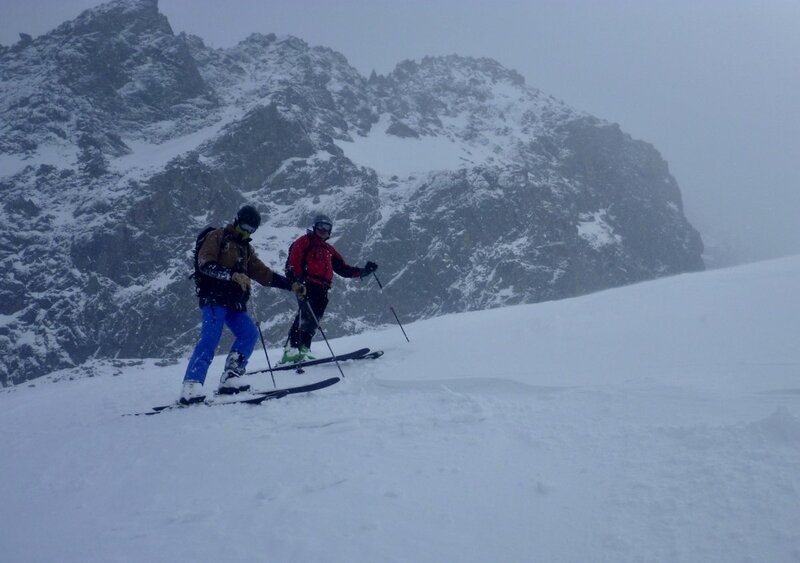 Team Size / Guiding Ratio: Maximum 2 guests to 1 Mountain Instructor / Guide. An existing level of good mountain fitness is required, especially for the 2nd day which could involve up to 8 hours on the go. This will mean you have existing mountain walking & some scrambling experience and good current aerobic fitness / endurance. Some previous rock climbing experience is also required but does not need to be extensive or on difficult routes. You should however already be able to safely put your harness on, tie in and belay. The rock climbing standard will be up to around V.Diff, but this will be in mountain boots and could be in the wet, so you should be able to do this. As mentioned yesterday, we really enjoyed it & thought it was a very well organised & professional two day training & we learned loads. Our guide/instructor, Jon, was great in every way and we loved the Plas Coch B&B, we’re hoping to be able to come back in the beginning of July for some more training before our Matterhorn attempt week later in July. Thanks a million! Would like to say I enjoyed the weekend training with Calum, what a top man, knows his stuff. 100% will be back in Wales for more training with you guys. I’m off in 4 weeks to have a crack at Ama Dablam. 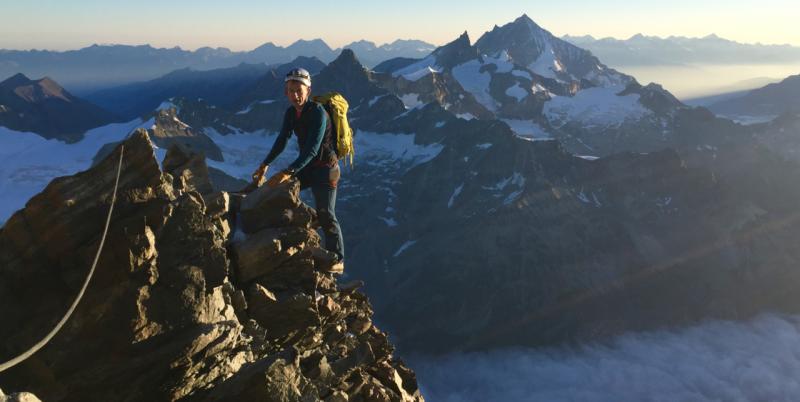 I know this was meant to be a Matterhorn training weeks end but I think this was well worth doing for any technical climbs outside of normal mountaineering. Its also now sawn a seed in my head to climb the Matterhorn next summer!!! This spring course in the Scottish Highlands makes an inspiring complement and progression from our Snowdonia Matterhorn training weekend. 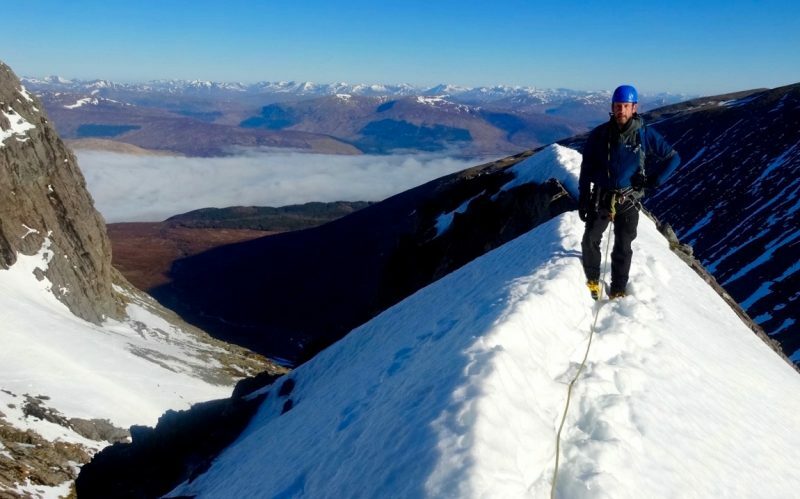 The high mountains of Lochaber provide a superb arena for alpine mountaineering in the spring, often a magical time to be in the far north. 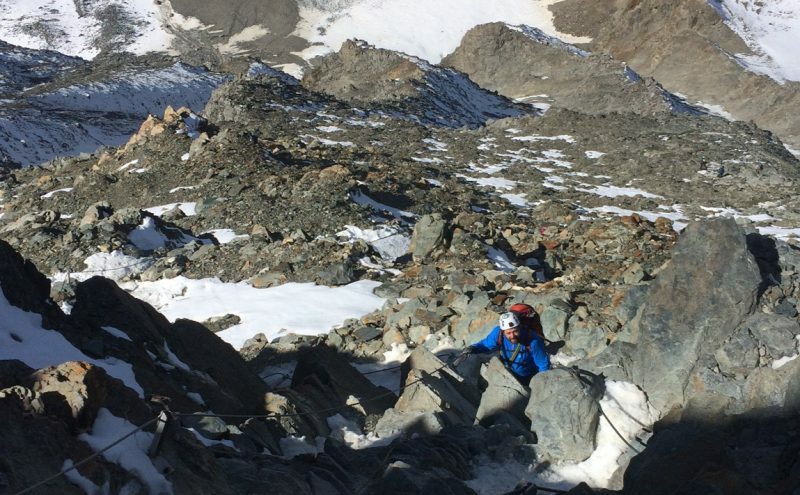 At this time of year they often provide a brilliant combination of stiff re-frozen snow for an alpine approach to a long rocky alpine ridge, often with an icy mixed finish, just like the Matterhorn summit climb itself! 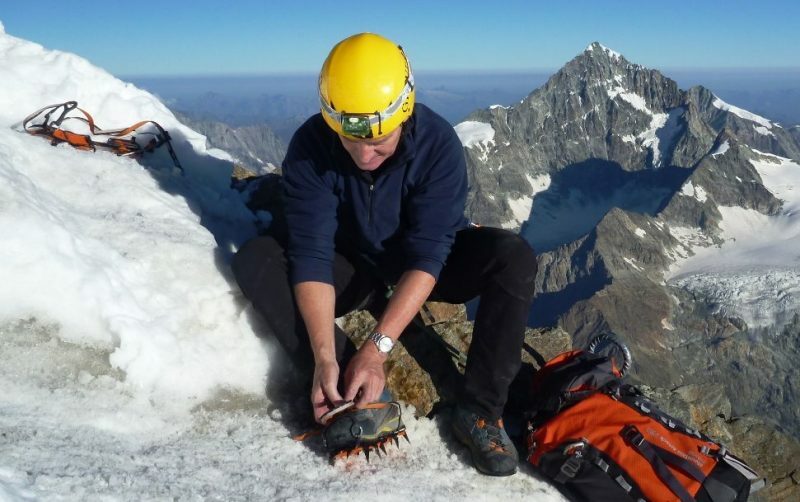 Crampons are generally used from ‘The Shoulder’ on The Matterhorn and the upper mixed, snow & ice section requires good crampon technique. Spring in the Highlands often provides great training for this. Careful cramponing on the short final summit ridge on the Matterhorn. There is a long section of icy mixed ground and summit snow / ice field to reach this point so good accurate & steady cramponing in required. Great views of the Monte Rosa Massif beyond. Here is a summary of the ‘Plan A’ schedule for the weekend which may have to be adjusted according to weather & mountain conditions at the time. 0730 start to the course, welcome & final equipment check – but please ensure everything is ready to go for the day, so we can get a swift start for a long day. 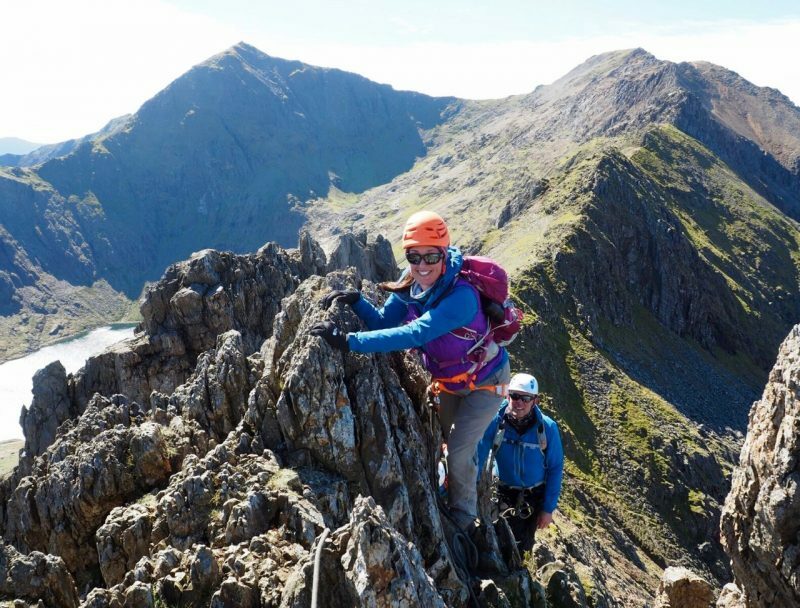 We aim to choose one of the longer mountaineering routes on the North Face, like Tower or Castle Ridge or North East Buttress to give a feel for moving swiftly and completing a ‘grande course!’. This will often involve an approach on sustained re-frozen snow giving an excellent opportunity to refresh and practice crampon skills before the crampons usually come off for the lower rocky section of the route where scrambling skills and moving together on the rope and short pitching / rock climbing in big boots can be practised. If time / conditions allows we will aim to descend an easier scrambling route like Ledge Route or one of the snow gullies or walk off the summit plateau and return to base camp / café for tea and cakes. Team dinner – traditionally curry! Exposed spring snow ridge, high on the north face of Ben Nevis. A remarkable ascent in its own right and superb alpine training. 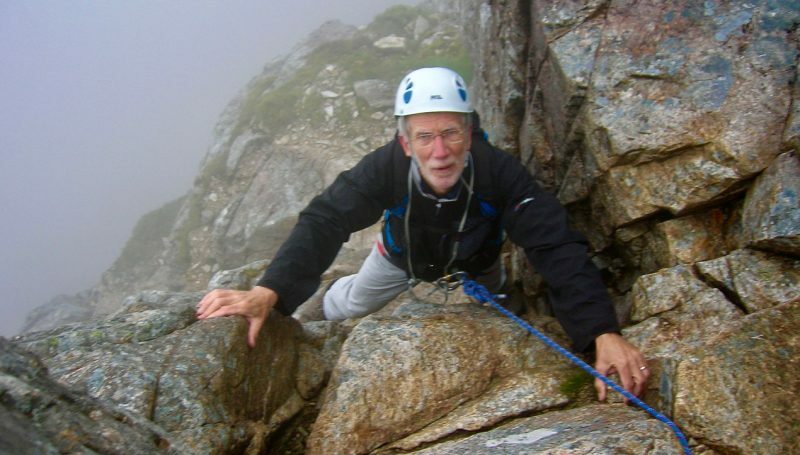 In the past we have climbed in Glen Coe, eg on Curved Ridge and with an ascent of the briliant steep V.Diff on the Rannoch Wall above it, Agag’s Groove. For the fit and keen we could also do a 2nd day on the North Face of Ben Nevis for example combining another 2 of the classic ridges on the mountain. Brilliant scrambling on Curved Ridge in Glencoe. Lots of good rocky options here for scrambling & big boot rock climbing & Matterhorn training. 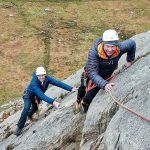 This course does not focus on rope work or too many technical skills as it’s more about scrambling & big boot rock climbing mileage, however you should already be able to safely put your harness on, tie in and have some experience of using a belay plate. 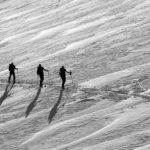 Some previous mountaineering experience and use of crampons / ice axe in winter or alpine conditions is required (although you could do a private guiding day beforehand if necessary). Just wanted to say that the weekend lived up to all expectations. The location & scenery was stunning especially on Saturday on Ben Nevis. Jonathan was great company and his experience and guidance were welcomed and added to the overall training, please pass on my appreciation. Loving the work on the snow with the crampons and the scrambling and rope work. I have come back with a taste for more and will spend the next week considering plans for the future to continue my mountaineering journey, perhaps a trip in the Alps will be next. I will let you know when I have made a decision. Finally thank you for the well organised trip from start to finish you have been always there to answer questions which helped with my planning and preparation. In 2017 we ran our first Matterhorn familiarisation long weekend in early autumn in Zermatt itself, at the foot of the Matterhorn! The idea was to give guests the opportunity to enjoy the atmosphere of the village, valley and amazing views of the mountain, without the pressure of having to actually climb it! With a programme along the following lines, there was plenty of opportunity for training on a variety of relevant terrain. This included rocky scrambling, big boot rock climbing, high altitude glacier journey / snow ascents, & icy mixed ground in crampons. 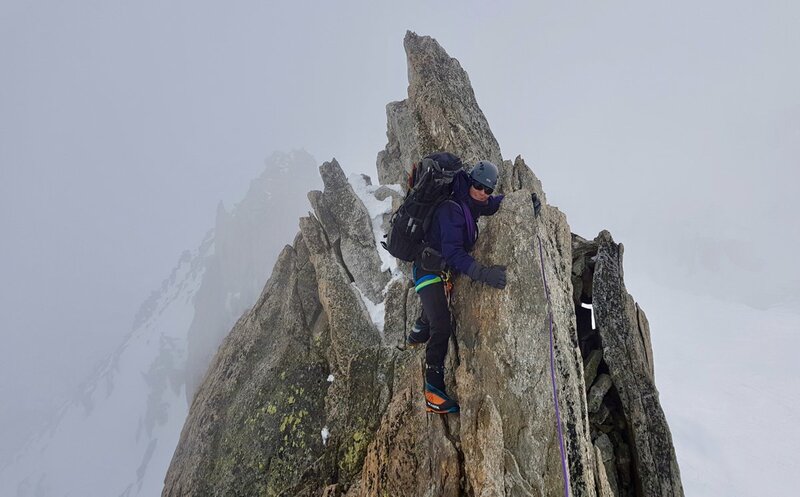 A great combination of fun climbing and giving a real insight in to what’s involved in the ascent of the Matterhorn with lots of relevant training along the way. 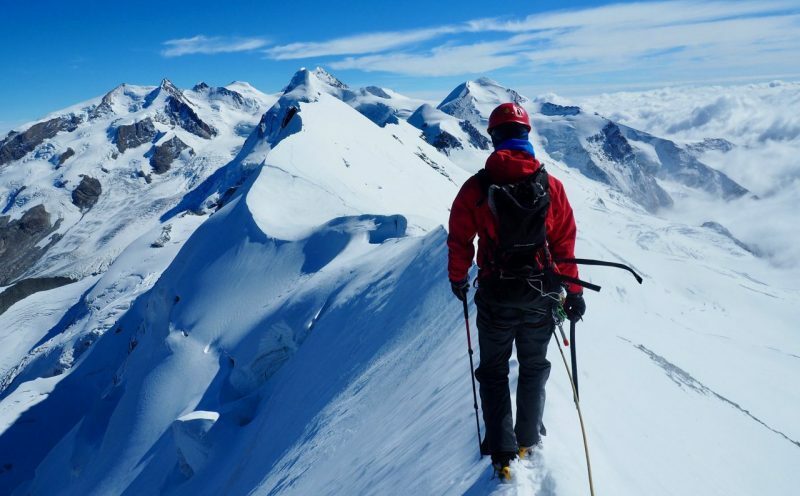 Superb snowy ridge mountaineering on the traverse of the West to Central summits on the Breithorn as part of our Zermatt Matterhorn training long weekend in early autumn.